The lawn was removed and replaced with decomposed granite. 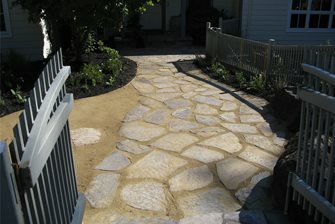 The design worked around existing elements such as this Three Rivers Flagstone patio. 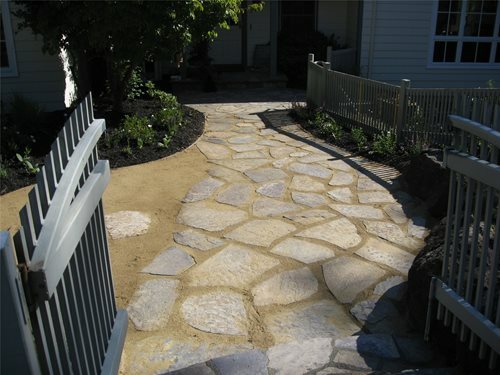 Walkways were created by setting matching Three Rivers Flagstone in decomposed granite. 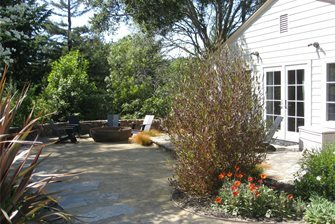 A large hopseed shrub adds privacy near the master patio. 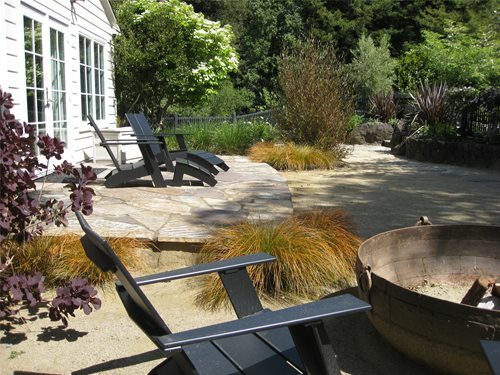 The homeowners found a rustic cauldron that was retrofitted to be a gas fire pit. Plenty of space was left between the fire pit and the existing wall for chairs to be added. The garden beds were re-planted with plants of varying sizes, shapes, colors and textures. 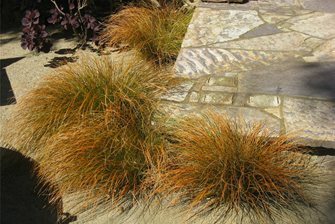 Carex testacea, also known as Orange New Zealand Sedge, softens the corners of the patio. A before picture of the lawn and master patio. A before picture of the overgrown planting beds. 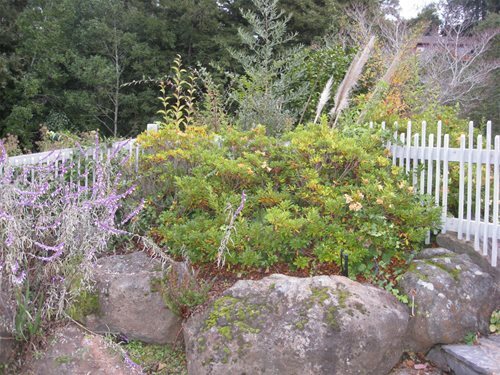 This family's patchy lawn and overgrown garden beds were not up to par. They rarely used the neglected space and knew it was time for a change. So they hired Eileen Kelly of Dig Your Garden Landscape Design to help them transform this portion of their property into an inviting outdoor living area. 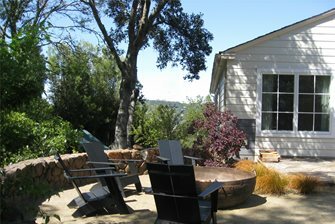 The property, located in Kentfield, California, which is part of Marin County, had some good features and some bad features. The good included a beautiful Three Rivers flagstone patio off the master bedroom, a curved fieldstone retaining wall and large boulders that defined the planting beds. Kelly, who likes to use what's already on site to save her clients' money, planned her design around these existing elements. The bad features included overgrown plants, a worn lawn and a lack of privacy. Additionally, the shape of the lot made it so that this portion of the yard was visible from the front. The first thing Kelly suggested was getting rid of the lawn, which had been nearly destroyed by the family dog. "At first, the husband and kids weren't sure about losing the lawn," she recalls, "but eventually they came around due to the lowered maintenance and water requirements." Stabilized decomposed granite was used in place of the lawn. "I used stabilized DG rather than gravel because it is much softer on the feet," explains Kelly. The stabilizer makes the surface strong and keeps it from becoming muddy and washing away in a rainstorm. Pieces of Three Rivers Flagstone that matched the existing patio were set in the DG to designate high-traffic walkways. Design Tip: Take photos of your garden from inside your home to determine where privacy or a focal point is needed. 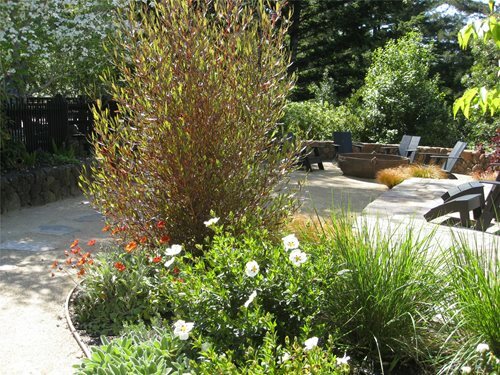 Kelly chose to tackle the privacy issue by creating living screens with a variety of plants. "I wanted to make the space feel separate from the front of the home as well as screen a neighbor's views," she says. In order to create a visual barrier between this area and the front of the home Kelly created a curved bed with large shrubs. "I try not to reveal an entire landscape at once," she says, "this way there is a sense of mystery and destination." 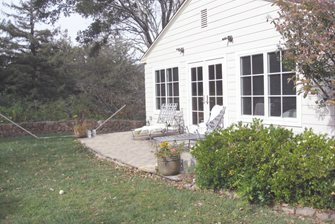 Additionally, Kelly placed a large hopseed shrub near the master patio and used a majestic olive tree to screen the living room window. 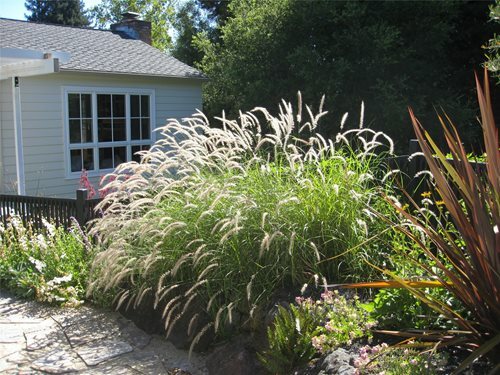 Other plants that help provide a sense of enclosure include Phormium and ornamental grasses. 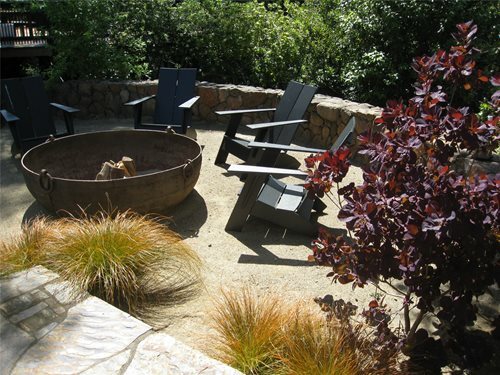 The fire pit is meant to be the central gathering point of the yard. It is a large rustic cauldron found by the client that was fitted with a gas ring and connected to an underground fuel line. 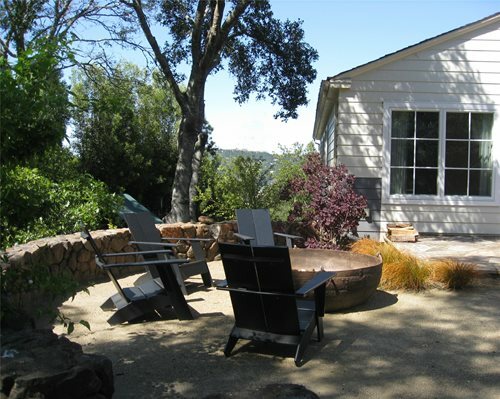 "We retrofitted the vessel for gas because in Kentfield wood-burning fire pits are not allowed," says Kelly. 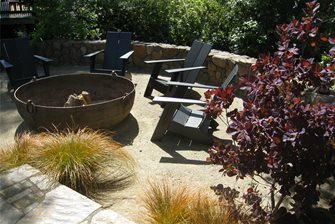 The chairs surrounding the fire pit were added by the homeowner after completion of the project. "I had toyed with the idea of capping the retaining wall and using it as a seat wall, but ultimately I decided that it was too high and too far out from the patio," she recalls. Kelly redesigned the garden beds by pulling everything and replanting to create continuity. She selected plants for this garden according to their leaf color, texture and architectural presence. 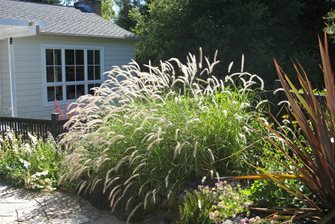 Additionally, the plants are low-maintenance, require limited irrigation and provide year round interest. "In order to ensure that the garden looks good in all seasons, I used burgundy and green foliage which provides great contrast," says Kelly. 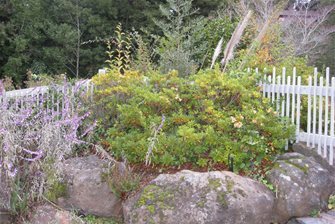 Plants on the outer edges of the garden were selected for their fragrance. 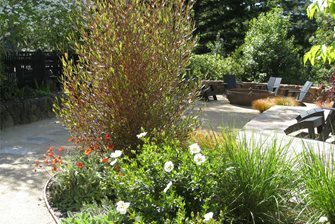 Design Tip: I suggest using a mixture of South African plants and California natives because they are well-adapted to our Mediterranean climate. 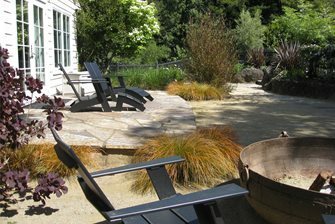 With the lawn gone, new shrubs and trees creating privacy, a unique fire pit and a well-thought out plant palette, this yard has gone from under-utilized to the place to be. Kelly feels that this property portrays her company's values of beauty, harmony and sustainability. 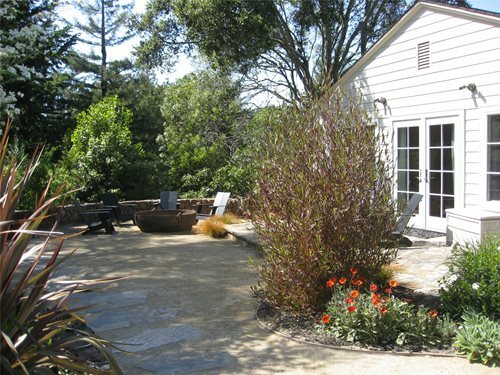 The garden harmonizes with nature by providing a habitat for birds and insects and it meets the homeowners' desired outcomes by providing them with a space in which they feel good. 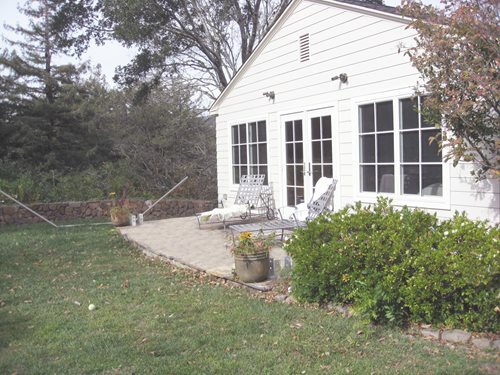 View a plan of this project: Lawnless Garden Master Plan.